Who is the oldest person in the world? Where does the person live and what is the name of the oldest living person in the world? While the questions are often more out of curiosity than anything else, there are answers that may assist us on how to unlock, well at least partially, the fountain of youth. While we are often intrigued to hear the name and location of the oldest living person on earth, another question is what is the secret to living a healthy long life? Answers vary, sometimes the answer itself is sure sign of the secret. Have you ever heard that the secret to my advanced age is a shot of whiskey before bedtime? I ate whatever was on my plate, usually greasy, deep fried stuff, some advanced seniors have stated. Some answers make us smile or chuckle, but the truth is sometimes in plain sight, or is it sound, because a sense of humor truly is medicine to both mind and body. Whether the age of the oldest person in the world is 110 or even 118, studies continue on a broad scale to find that elusive fountain of youth. After my great great great grand aunt, Ethel Parker Hooper, had passed to those streets of glory, I can almost hear her say, now what is an internet, and are you certain that it is not unsafe to use like the microwave oven? Could you explain to me one more time how war ever solves anything? And will you mind your manners and never ask a lady her age -- and don't forget my birthday is soon, I'm turning 110 or is it 109? Born in 1899, Ethel Parker Hooper experienced three centuries and witnessed many changes, from the first telephone to the first automobile. She was born just one year after Theodore Roosevelt and his "Rough Riders" made that famous charge on San Juan Hill. She had even listened to first-hand battle accounts from American Civil War veterans. Hooper, my triple great aunt, was one of California's senior citizens and one of America's eldest persons. Her grandfather, John Henry Parker, had served in the 62nd North Carolina Infantry during the American Civil War, and when he had died, Ethel Parker Hooper was 19 years young. Another Parker, Edna Parker, born on April 20, 1893, is confirmed and verified to be the oldest living person in the world. 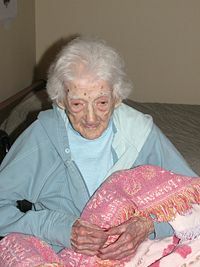 She entered the top 20 verified oldest people ever in June 2008, aged 115; Parker currently resides in Indiana. Courtesy the "The Sacramento Bee"
Ethel Hooper was born in the 19th century, lived straight through the 20th century, was a widow for 74 years and finally succumbed to complications from the flu well into the 21st century. She died March 20 with family at her side. She was 108 and 8 months – and may have been the oldest person in Sacramento County, though she went to her grave believing it was impolite for anyone to ask her age. Born in 1899 (the same year as Humphrey Bogart and Ernest Hemingway), Hooper was witness to two world wars, the Great Depression and pretty much the entire age of invention, from the telephone to the cell phone, the airplane to the jet engine, Corn Flakes, the Frisbee, instant coffee, TV, TiVo, the PC and the MP3. She never drove a car or surfed the Web or sent an e-mail. She could have easily stated: "Been there, done that!" However, her longevity was no accident. She was health-conscious before there was a health movement, opted to walk most places instead of drive, was always picky about what she ate and never smoked or drank. "She credits her longevity to that. She lived in Seattle for 50 years and walked everywhere," said Krista Vernon, the wife of grandson Herbert Hooper Jr.
Ethel Hooper was born and raised in Tuckaseigee, N.C., a small town near Asheville. By 19 she was married and by 34 was a widow, left to raise four children on her own. She never remarried. She and her children were living in Dayton, Ohio, during World War II, but Hooper decided to uproot the family on a moment's notice, concerned that the area could be a target for enemy bombs because it was home to a major ammunition factory, said Vernon. After raising her children in Sedro-Woolley, Wash., she spent the next five decades in Seattle, pressing clothes at a dry cleaner. When she was 100, she decided she had had enough of the cold and wet weather of the Northwest and moved to Scottsdale, Ariz., to live with her daughter. Soon after, she began splitting her time between Sacramento and Scottsdale. 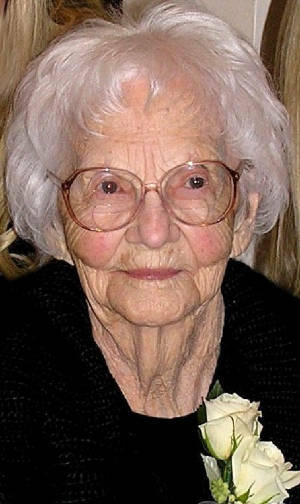 Though she suffered hearing loss later in life, Hooper was spry and healthy until well past 100. She maintained her own vegetable garden, including working the soil with a hoe, until she was 97. Four years ago, she was in a car accident in Sacramento that left her with a cracked pelvis, forcing her to use a walker and a wheelchair, which she insisted on rolling under her own power. Her family moved her into Sunrise Assisted Living, where she made many new friends and became known for singing hymns, even in her sleep. "Amazing Grace" was her favorite. Though she was born during the William McKinley administration and some 50 years before the invention of the cake mix, Hooper always welcomed the technological innovations she encountered. "When you think about everything she witnessed the invention of, which was practically everything, she wasn't shocked by it," Vernon said. "You could hand her a cell phone and she would say, 'Oh, this is nice.' "
An avid conversationalist, Hooper sometimes felt betrayed by her memory when she tried to recall old friends and neighbors. "She would say, 'You know the guy down the street? Oh gosh, it drives me crazy that I can't remember his name' – well, that was 70 years ago," Vernon said. In her later years Hooper was prepared for death. She had plenty of experience. Scores of friends and loved ones had gone before her, including her 21-year-old son killed in a logging accident. That tragedy loomed large in her heart the rest of her life. "She was going to be with Jesus. She was very ready and knew that's where she was going," said Vernon. "We miss her because she was spunky and would say funny little things, but we know she was really ready. The quality of life at that age, what do you have to look forward to except visits from her family. Every friend she's ever had is gone and that can be lonely." Sources: The Sacramento Bee (located online at sacbee.com); Guinness Book of World Records; Chicago Sun-Times.